After two days of hiking at Smith Rock State Park, we had just one day remaining in the Bend area. 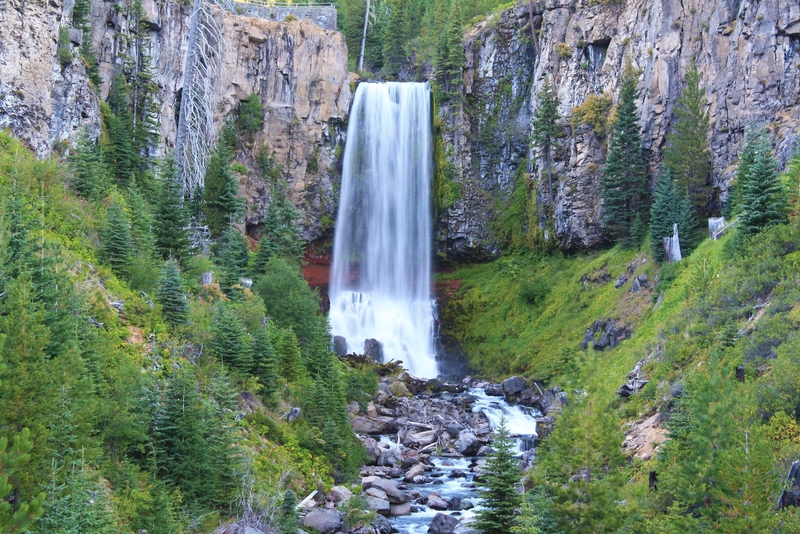 High on my bucket list was the 6.8 mile loop hike above Tumalo Falls. 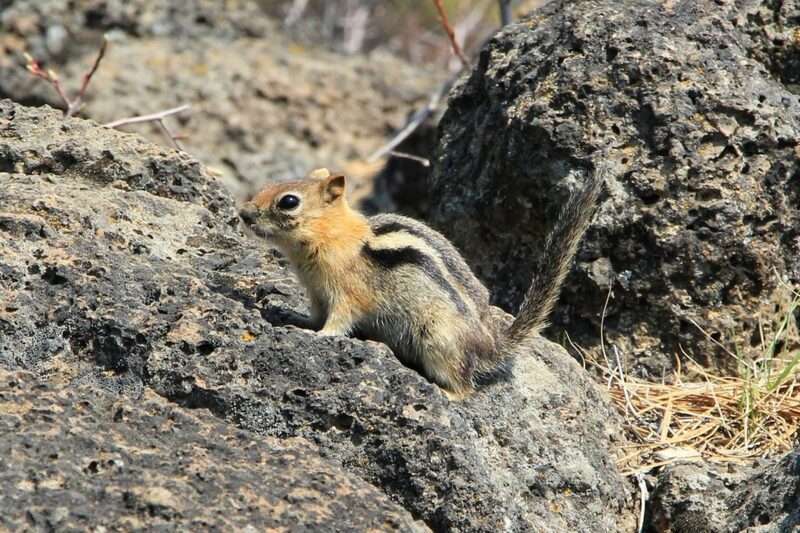 We had seen Tumalo on our first trip to Bend back in 2010. At that time, I didn’t realize there was a loop hike to a handful of additional falls. I knew hiking the loop in late April was a crap shoot—that the trail might not yet be passable, but we decided to give it a try. Unfortunately, the trail was a solid sheet of ice and we turned around after just half a mile. 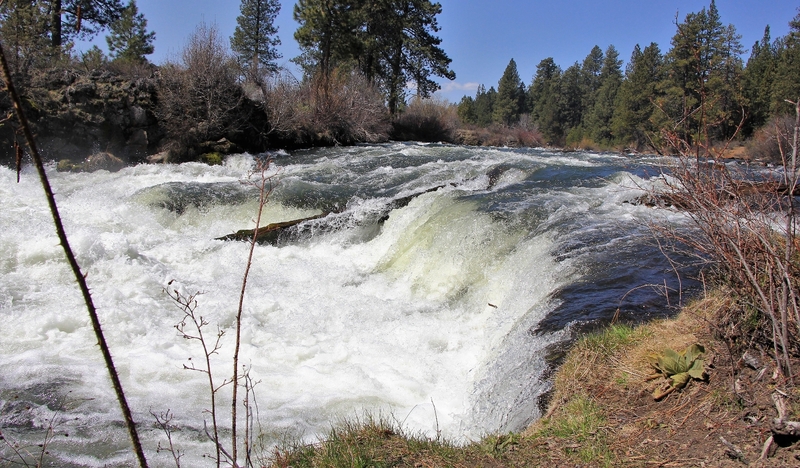 My backup for the day was a stretch along the Deschutes River to Dillon Falls. From my research, I had learned that Dillon is a series of rapids over the course of 0.3 miles. While the drop of the falls isn’t impressive, the volume of water rushing through the lava canyon is ten times more than the flow over Oregon’s iconic Multnomah Falls. 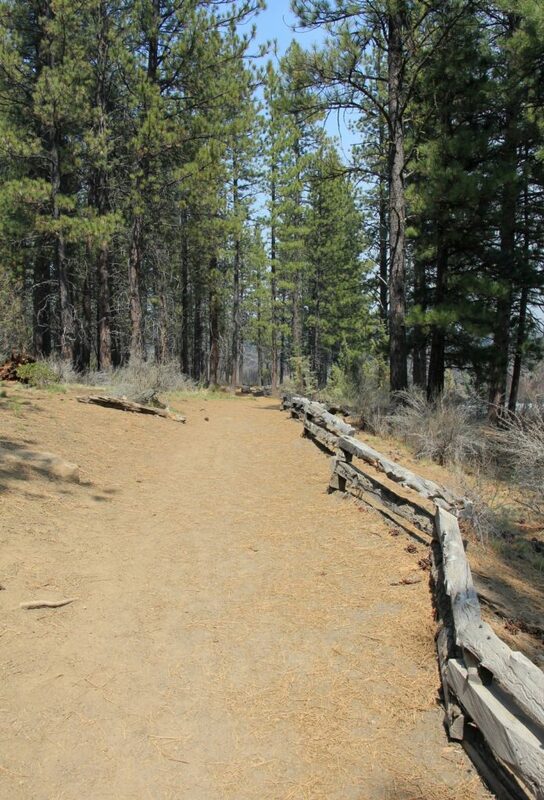 The Deschutes River Trail south of Bend offers hikes 8.7 miles of easy hiking. With half a dozen access points, there are a multitude of route options. We chose to start at the Lava Island Falls Trailhead (elevation 3,900′). I was disappointed to find there wasn’t a good view of the falls from the trail. So far we were 0 for 2 on the day! Undeterred, we continued along the trail heading upstream (south). 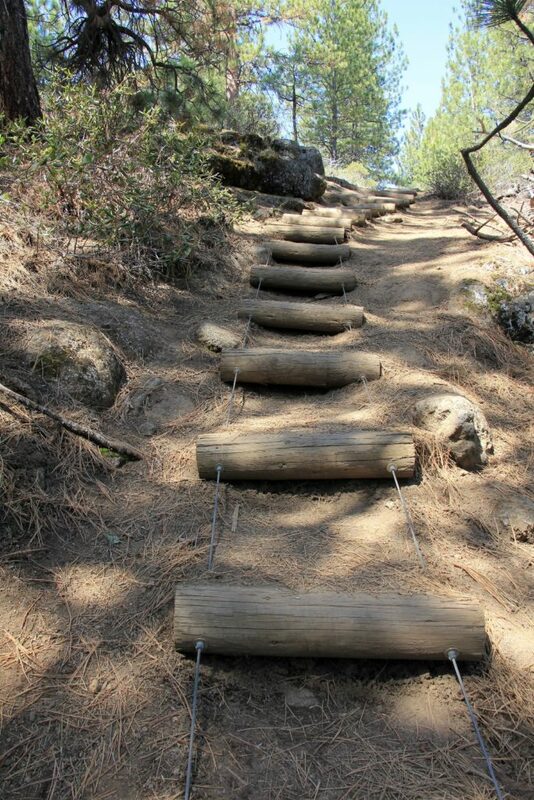 Hiking was easy as we followed the ponderosa pine shaded trail. We generally stayed within view of the river which made for a pleasant stroll. 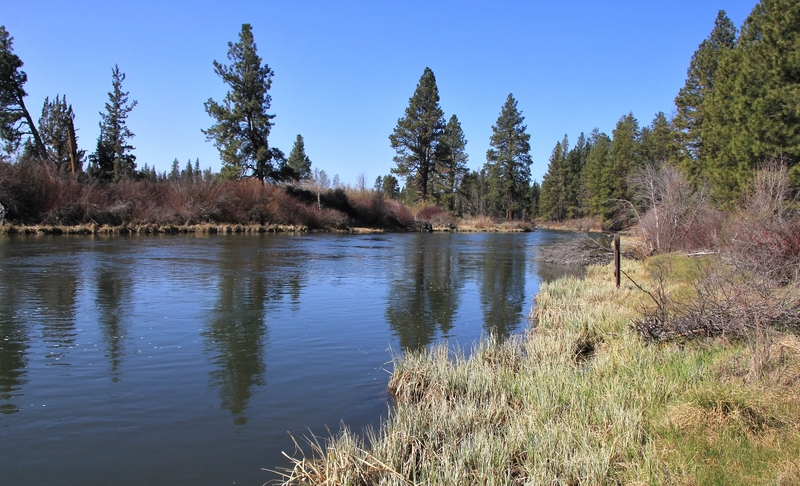 Across the Deschutes, we could see large areas where ancient lava flows had come right down to the river’s edge. 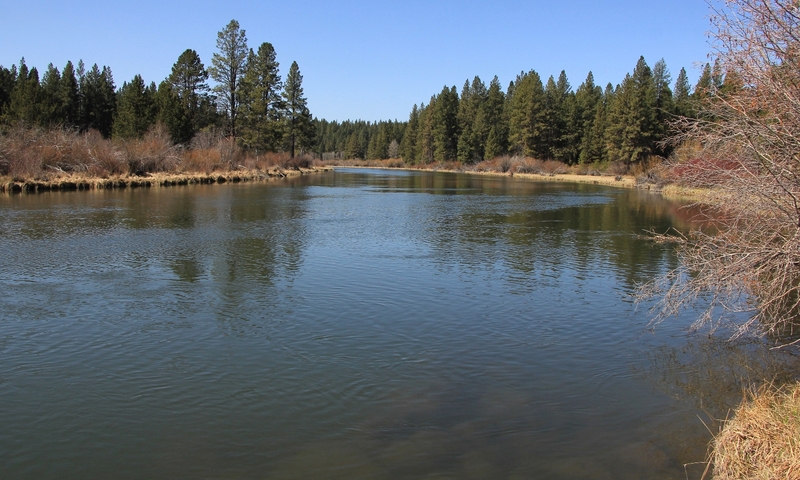 At 1.1 miles we came to Big Eddy Recreation Site which provides another access point for the Deschutes River Trail. My map showed a waterfall here, but it must have been more of a rapid because we never noticed any feature of significance. 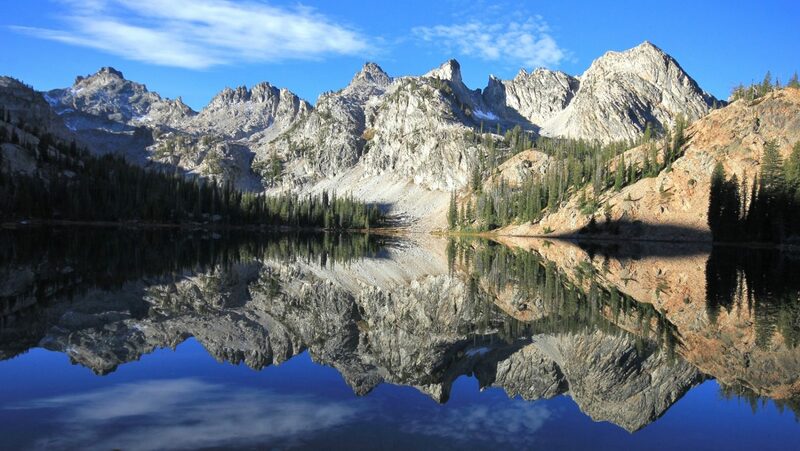 Continuing upriver, the river became much more tranquil and the surface, at times, seemed like glass. At 2.1 miles we passed Aspen Recreation Site. Like Big Eddy, this is another trail access point. 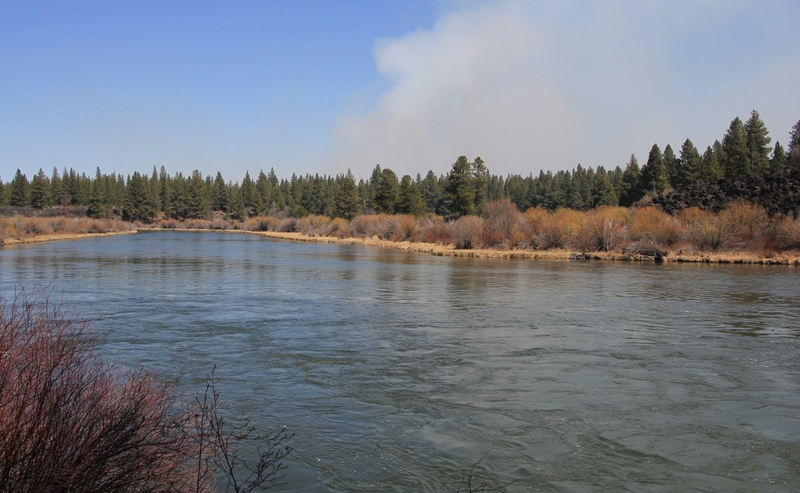 Continuing on, the river remained calm until we were almost to Dillon Falls. As we neared the falls, the trail turned away from the river and made a short, steep climb up some steps. 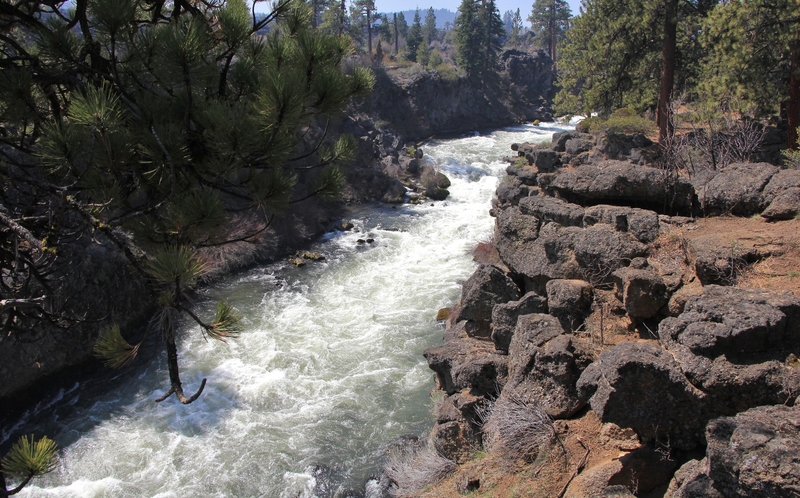 At a little over 3.0 miles, we found ourselves on top of a narrow lava canyon that was putting the squeeze on the Deschutes—we had arrived at Dillon Falls. We took our time exploring the length of the falls. In places, side trails took us right down to the water’s edge where we could really feel the force of the river. 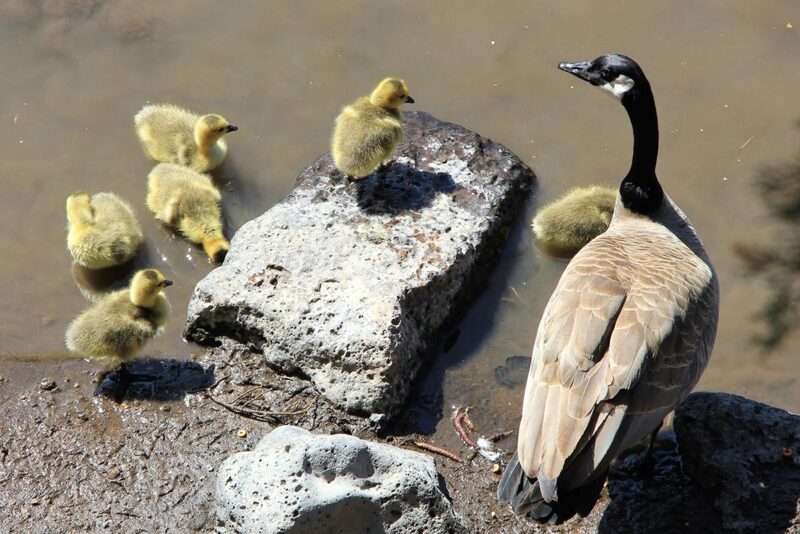 As we were taking a break at the falls, we struck up a nice conversation with retirees out enjoying the sunny afternoon. Suddenly the conversation stopped and one of us said, “do you smell smoke?” Apparently they were doing a controlled burn just downriver and it didn’t take long for the smoke to move in. It was never terribly thick, but it did make for a hazy return hike. 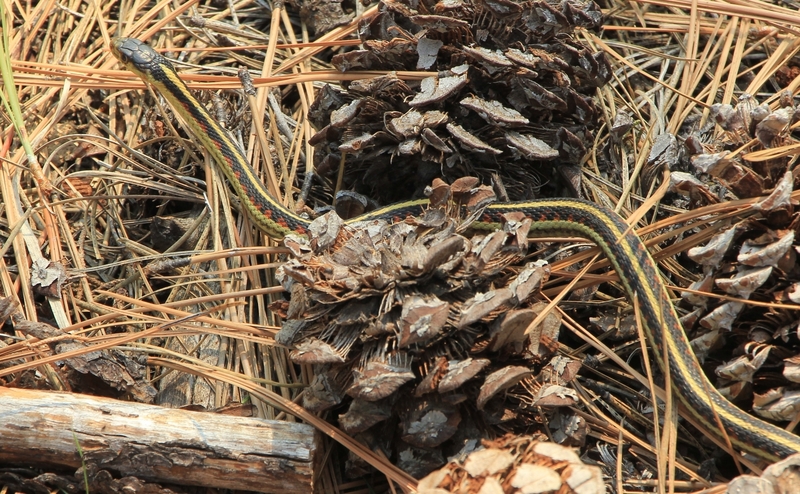 This was an unwelcome surprise after the wildfire filled year we’d had in 2017. 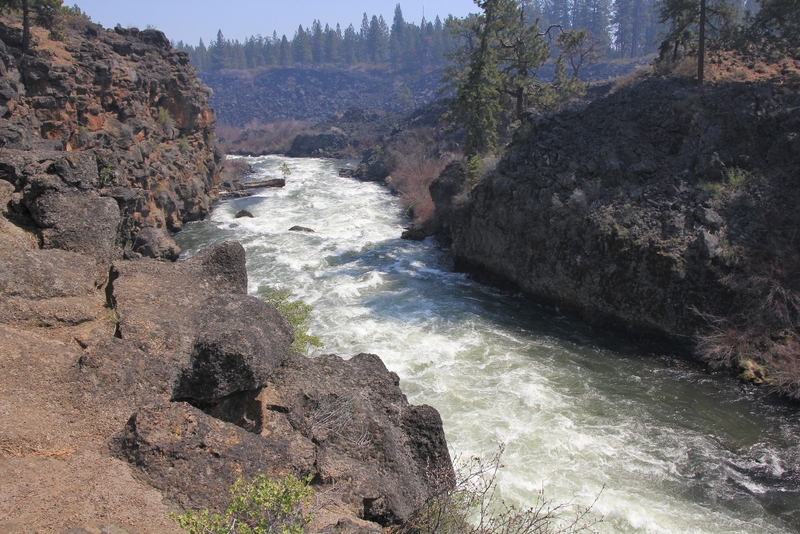 We had an uneventful hike back to the car where the GPS put us at 6.6 miles for this hike along the Deschutes River. It was a nice enough stroll, but I couldn’t help but be disappointed we’d missed out on the Tumalo Loop. If I were to do this hike again, I’d likely park at Big Eddy or Aspen Recreation Site and then hike further up river to see Benham Falls which is located roughly 3 miles from Dillon. 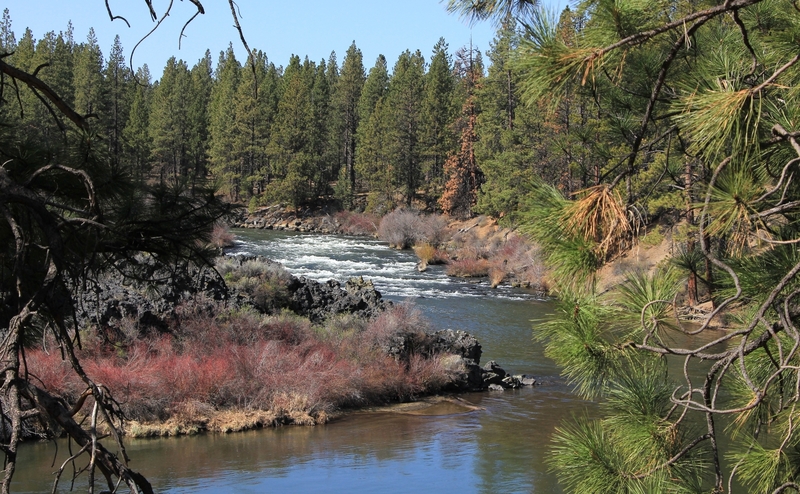 Directions to the Lava Island Falls Trailhead: from Bend, Oregon, travel west 7.9 miles on highway 46 then turn left onto Forest Road 41. Drive 0.4 miles and turn left onto Forest Road 4120 and continue 0.8 miles on a single lane dirt road to the small parking area. A Northwest Forest Pass is required. Click here to see some of our tried and true gear. By accessing Amazon through the links on this page, you get the same GREAT Amazon pricing and they share a little with us. This helps us maintain evansoutdooradventures and is much appreciated! Thank you to our supporters! To bad about the Tomalo Loop trail .but this one doesn’t usually open up all the way till mid June .any time before you need micro spicks and snowshoes It is a great hike and there are a total of seven waterfalls along the way . One is off the trail about 1/3 mile that most people miss . this is another one of those places that you need to come early and it will put you ahead of the crowd . Bike riders will be on half of the loop only and going up hill riding only ( they have another route to come back on ), but again they don’t get started till 10 or 11am so not a problem if you are doing the whole loop . The first half is the river part and the other is up and over a ridge with some nice mountain views and one more waterfall 1/2 mile from the end before the parking lot . Living in Salem I have the best of everything within 2 1/2 hour drive and I’ve covered a lot of it and still have more on the books . Salem would be a fantastic base! No wonder your Flickr is full of beautiful photos 🙂 Yes, we will definitely be back for Tumalo. I knew it was a long shot at best. I was hoping for more snow than ice (but knew that probably wouldn’t be the case). Thanks for the tips, I’m not surprised that this is another busy/popular one.